Most people seem to have some idea of how their 20’s will work out. Usually it involves some blend of relational milestones, career achievement and impact making. But what happens when things don’t work out as planned? 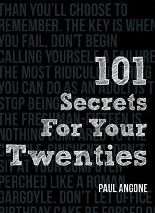 That’s where Paul Angone steps in with his book 101 Secrets for Your Twenties. As you can probably guess from the title, the book is made up of 101 ideas about living well in your twenties even when your dreams aren’t coming true. Some of the secrets are funny, some are serious and it covers a wide variety of the craziness that’s often encountered at this life stage. There are a few things I really liked about this book. One was that it is the right kind of positive. Some books are an annoying, grating positive that sound like a cross between a bad graduation speech and an inspirational bumper sticker. This isn’t one of those books. It is hopeful and encouraging while avoiding the platitudes and acknowledging the realities of life. Another thing I really appreciated was in the book was its encouragement to not go it alone but to seek community and help. That is not necessarily something that gets enough focus in our individualistic society. I was particularly happy to see the emphasis on putting deliberate effort into developing meaningful friendships (secret 70) and pushing through the awkwardness to get professional mental health help if needed (secret 7). I think the thing I liked the most about this book though was that it made me feel less alone. It is easy to look at other people who seem to have it all together (and have the Facebook photo albums to prove it) and wonder if you are doing something wrong. It is incredibly reassuring that other people find post university life disorientating, hard or disappointing sometimes but still find a way to thrive even though things didn’t play out as they planned.